Roland CAMM-1 GR-420 Vinyl Cutter/Plotter, Includes Stand! Home > #1 Source For Roland Vinyl Cutters - Hobby to High Production! 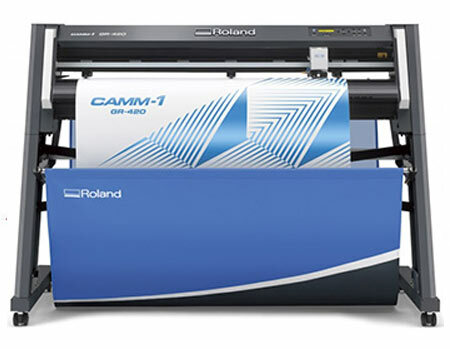 > Roland CAMM-1 GR-420 Vinyl Cutter/Plotter, Includes Stand! Available in 42”, 54” and 64” model sizes, GR cutters are powerful, easy-to-operate devices. Packed with advanced and versatile new features, they are designed for a whole new level of sign, apparel, vehicle graphics and packaging production. Acceptable media width: 6" to 48"
See Right Side Navigation For All Vinyls, Rhinestones, Supplies & More!